This past week I have cracked three WIP's leaving me with just the Ten Stitch Blanket to pick up, but not in this heat. 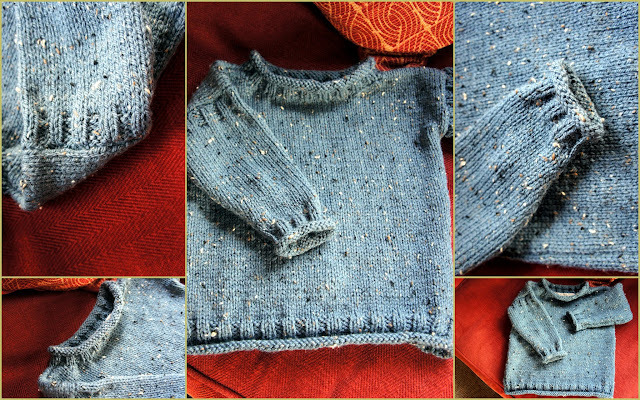 I have completed the other jumper for Rufus - this was the Slouchy Jumper - which I modified, as most people that had completed this said it was too short for the width. I have to agree, as I pulled out my first attempt and sized down the pattern so that it wasn't so wide in the body and added a bit more too the length. Rufus is lean and long. I am very pleased with the yarn which came from Aldi - Kirton House Rustic Aran, lets hope it washes ok. I've not tried it on him yet as its a bit on the warm side for a thick jumper. But hopefully he will model it for me over the next few days. My youngest has asked me to knit her a mat for her new bathroom along the lines of the one I did for myself. I have managed to find enough cotton yarn in my stash in the shades they have used for the tiling, so shall start that when I have a minute. That bathroom mat looks like something I need to add to my library..
Really cute -- love it! I love this - the design and the colour. You are really making me itch to start knitting again for my cousin's daughter who is about the same age as Rufus. I have yarn by the bagful to make things for her but seem to be always knitting for other people and/or running out of hours in the day. I wondered how long it would take you to start another ten-stitch :-)).